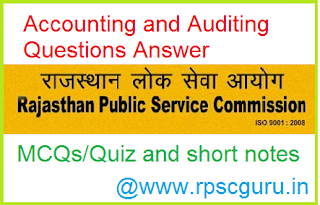 Dear Rpscguru expert readers good news we are here with Important Questions Answers of Accounting and Auditing for RPSC JR Accountant and TRA exam. 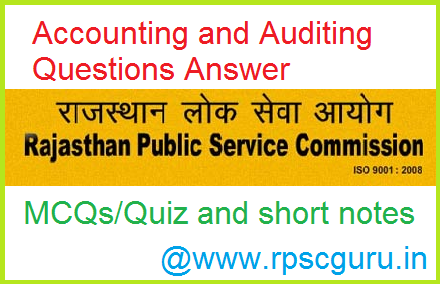 All questions are covered previous year questions and which asked in various level examinations and selected questions are possible for upcoming examinations. After read carefully of all Questions you can able to get high scored of marks in RPSC JR Accountant Second Paper. Question: Balance Sheet is always prepared:. Answer: As on a specified date. Answer: Changes with volume of production..
Answer: Based on Sales forecasts of market. Question: The requirements of an audit report for a Banking Company in Pakistan is under:Answer: Under (a) and (b) above. Answer: Part of Owners Equity. Question: Directors Report is ---- in respect of financial report constituent. Answer: Prepare accounts in a prescribed manner under the law.